This course uses MyLabsPlus which contains the eBook (also named e-Text - you do not need to purchase it separately) in addition to interactive media content with links to tutorials and quizzes to help you remember what you learn. CCCOnline courses do NOT use an access code to gain entry to MyLabsPlus products and are not required to enter a username/login and password. 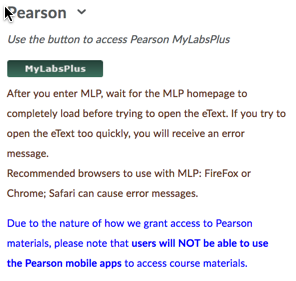 MyLabsPlus is accessed through the Pearson widget on the Course Home page. 1. Access the MyLabsPlus portion of your course through the MyLabsPlus button on the course home page. a. If you are enrolled in more than one MyLabsPlus course you should select your course. 2. Click the eText links in the left navigational area to open. 3. A User License window may display> Accept the User License, if applicable. More information regarding CCCOnline Digital Content can be found at the CCCOnline bookstore. Pearson Technical Support information can be found here.